Guyana Tourism Authority (GTA) 2018 Awardees and top officials of the GTA and Tourism Hospitality Association of Guyana (THAG). The awardees include Tour Guide of the Year, Adrian Shiwram; Rewa Eco-Lodge, represented by Mr. Dickie Alvin, for most outstanding community-led and owned tourism enterprise; Canadian Executive Services Organisation for outstanding contribution to tourism by a non-governmental organisation or volunteer group, represented by Ann Persaud; King’s Hotel and Residences for outstanding service for tourism accommodation establishment; Back Yard Cafe, for service quality in tourism, represented by Delvin Adams; Guyana Carnival by Hits and Jams tourism entrepreneurial development received by Kerwyn Bollers; recognition for tourism investment by the Wyking Ranch, and Surama Eco Lodge for the people’s choice award for sustainable tourism. 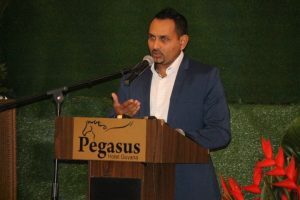 The Tourism and Hospitality Association of Guyana (THAG) wants government to invest some of the oil boom revenues and at the same time protect the country’s biodiversity by banning the wildlife trade. 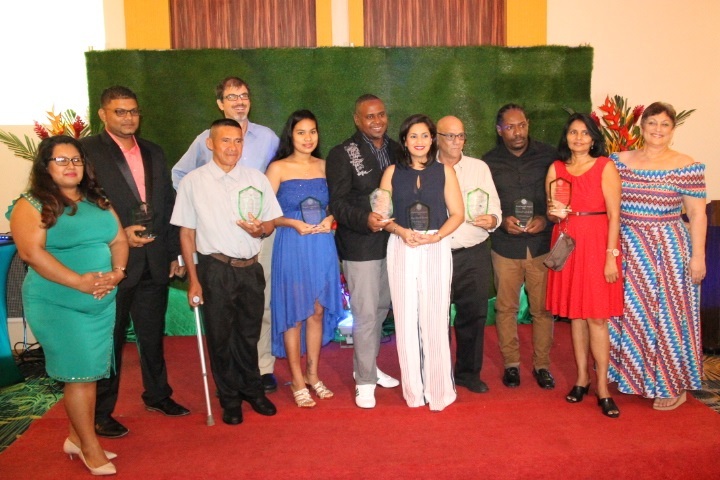 THAG’s President, Mitra Ramcoomar issued the calls at the Guyana Tourism Authority’s Award Ceremony held Tuesday night. “What will make this industry sustainable is sustainable practices…we need to preserve what we have. It comes off when I call for a ban on the wildlife trade; it’s for that reason. We need to protect our ecosystem. We need to protect this national treasure that we have and we need to value it,” he said. Against that background, he called for an end to the use of mercury in gold mining and pollution of waterways. Still in the area of the environment, Ramcoomar called for the recycling of waste and reuse of certain products. President of THAG – Mitra Ramcoomar. 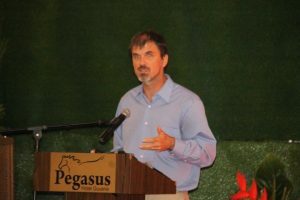 Addressing a well-attended event at the Pegasus Hotel, the long-serving THAG executive, he recommended that government spends some of the oil revenues to make tourism a “new frontier industry” because it ties into the creative arts, agriculture and manufacturing with the aim of creating a significant number of jobs. “I am saying that let us use the oil revenues to fund tourism. When I talk about tourism, I am talking about it widespread and the triple bottom-line effect,” Ramcoomar, also a senior official of the privately-owned Roraima Group of Companies. He cited the United Arab Emirates and Dubai which has been able to use its oil revenues to build a sustainable tourism sector. “I am saying that what we should do is promote Guyana as the green heart capital of the world and that would make us a world leader because of the sustained level practices and what they bring for the world and humanity,” the THAG President added. Meanwhile, GTA Director Brian Mullis said his organisation was about to support the Green State Development Strategy through a flexible 2018-2025 Guyana Tourism Strategic Action Plan. “It is a living plan so it is going to continue to evolve as circumstances change. It provides us with a road-map for destination management,” he told the awards ceremony. GTA Director – Brian Mullis. Mullis also announced that the strategic plan would be supported by the Living Destination Plan that would guide investments in new attractions and eco-lodges based on demand. “…so moving away from a supply-driven approach to tourism development to a market-driven approach to tourism development to markedly increase the success of any new travel and tourism ventures,” the GTA official. Other achievements, he said, are “clearly defined roles and responsibilities” of the THAG and GTA partnership, training programmes, database development and collaborative marketing. “Our marketing budget is really limited compared to most if our neighbouring destinations, if not all of them so the more that we can secure matching funding for things that we together want to accomplish, the more that we can accomplish with one another,” he said. Other private sector partners are Bushmasters, Wilderness Explorers, Evergreen Adventures, Caribbean Airlines and American Airlines. He reiterated that developing and promoting Guyana’s tourism product is being done through collaboration to maximise socio-economic and conservation outcomes and improve overall visitor experience. I think you could put on a little weight.